Those cookies have a sticky delicious secret!!! I know, I could hardly take it–gingerbread and caramel are just a match made in heaven! Thanks Anne! 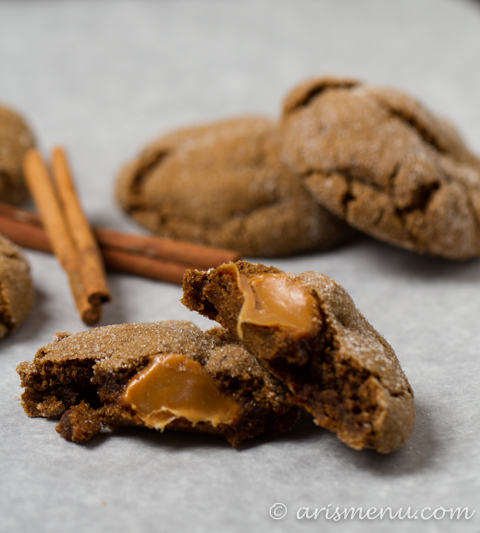 Given my current crazy obsession with molasses, I’d be all over these in a heartbeat… and the fact that they’re stuffed with ooey, gooey caramels just makes my brain want to explode over the sheer deliciousness of it all. LOVE how they use apple butter! 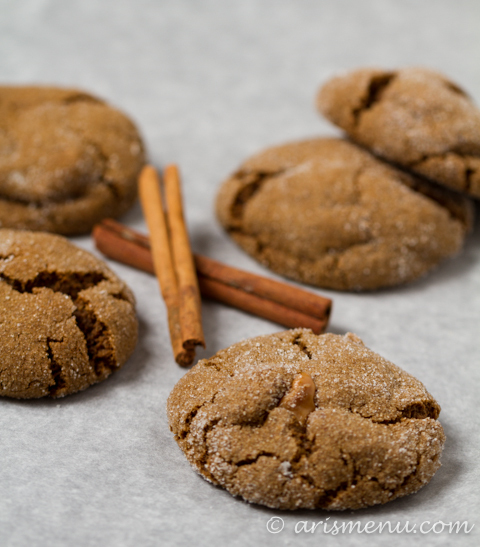 Molasses makes almost everything better. Yesterday I was trying to figure out how to put it in macarons, but I think that’s just a task that will have to wait until I have a lot of patience and free time, hehe. Thanks friend!! molasses is the new maple syrup! so good and pairs nicely! like these, oh my! I looove maple syrup too. I mean, pretty much anything with sugar and I’m game…clearly. i’ve never used molasses before!! is that weird?? You know, I’ve never done a cookie swap either! Lol. I’ve always wanted to do one though. 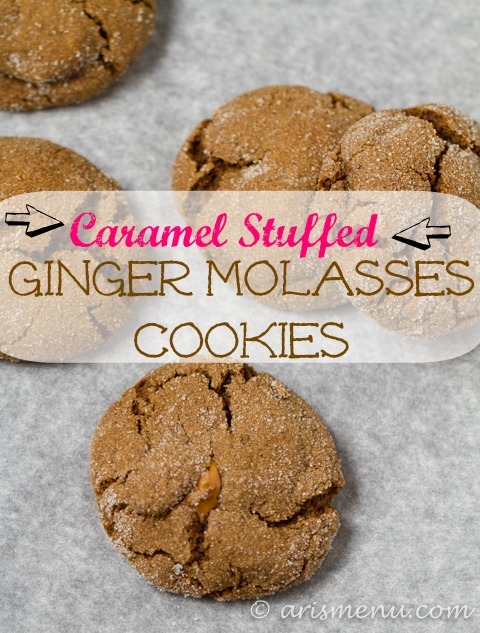 Gosh I love ginger cookies and these look irresistible. I’m a sucker for a soft cookie and I’m crazy for that gooey caramel! It’s funny, I made that video, and then this year I get invited to two! Except I only like to bring the cookies. I don’t like to take anyone’s cookies home because…well the LAST thing I need around here is MORE cookies! Molasses screams ooey gooey mess of goodness! Adding ginger just takes it to a whole ‘nother level. Yum! 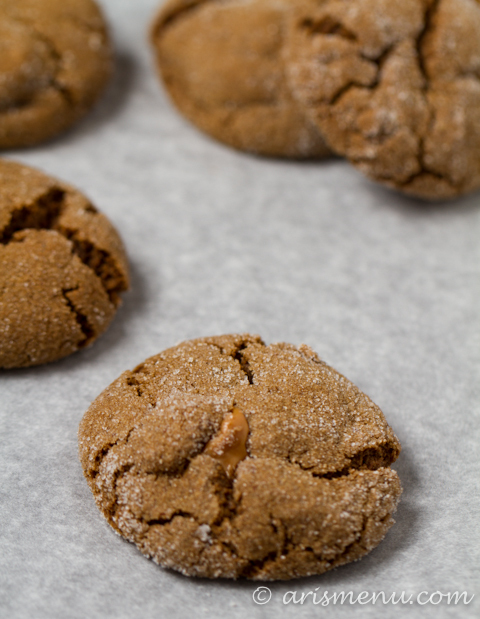 Ginger molasses cookies are, without hesitation, my favorite cookie of all time. Why did I not think to introduce caramel to them? My family is going to LOVE these at Christmas. I’m so glad we did a cookie swap at book club – I’m pretty sure it was the first time I’ve ever done an organized exchange, too! I’ve been munching on them all week long. 🙂 Another great Drink & Dish!! OMG I absolutely LOVED your cookies Jenn! I couldn’t stay away from them! Thanks for always being such a great support with D&D–it really means a lot! I’m just curious which kind of caramel? Just the cheap squares or something better? Thanks! It’s best with homemade caramels, but any caramels will work. If you use cheaper ones, you may want to heat them in the microwave for about 10 seconds before eating if they’re not still warm. Enjoy! Could i use applesauce in place of apple butter and then just add more spices to cookie dough? Also, does this recipe not require xanthan gum… And I’m assuming that the ginger is dried and not fresh. You can, but the texture will be cakey. 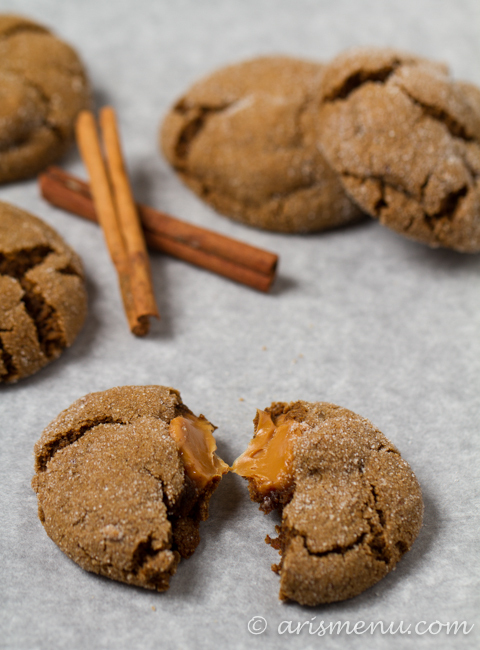 Apple butter provides a different cookie texture. And yes, the ginger is dried.